Phytoplankton are single-celled organisms that serve as the base of the marine food web and provide half the oxygen we breathe on Earth. They also play a key role in global climate change by removing carbon from the atmosphere and injecting it deep into the oceans. Scientists study phytoplankton to understand how the tiny plants help transport elements like carbon through the environment. 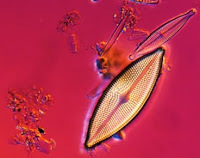 Although they understand much of what phytoplankton do, less is understood about why particular plankton live in particular environments and what maintains the diversity of phytoplankton. Previous research has suggested that more diverse ecosystems may be more efficient at utilizing resources, meaning that the diversity of phytoplankton could be important for regulating the cycles of carbon and other elements in the ocean. But scientists need a better understanding of that diversity before they can understand how much carbon the ocean ultimately removes from the atmosphere. Researchers from MIT’s cross-disciplinary Darwin Project, a collaboration between the Earth System Initiative (ESI) and the Computational and Systems Biology Initiative (CSBi) and funded by the Gordon and Betty Moore Foundation’s Marine Microbiology Initiative and NASA, have developed a computer model to simulate ecosystems in a virtual ocean, a model that could guide future field surveys of phytoplankton. They suggest that the diversity of phytoplankton species at a given location depends on the balance between the removal of species through competition for limited nutrient resources and their replacement by ocean currents, according to a paper published online Feb. 25 in Science Express. In order to grow, phytoplankton need sunlight and nutrients like carbon, some of which comes from the carbon dioxide in the atmosphere. When phytoplankton die, some of their cells sink to the ocean floor, taking carbon away from the atmosphere and injecting it deep into the ocean through a process known as the “biological pump.” To understand the global scale of this process, scientists must learn more about the diversity of phytoplankton species. “We feel this paper is a step toward understanding what the phytoplankton diversity is at different places in the ocean and what regulates that diversity,” said lead author Andrew D. Barton, a graduate student in the Department of Earth, Atmospheric and Planetary Sciences (EAPS). Although future studies will have to make a more explicit link between phytoplankton diversity and the climate, Barton hopes that his group’s models could be used as a tool to inform future sampling surveys that try to map phytoplankton diversity in the ocean. Barton and his colleagues used a computer model developed in 2007 by co-author Mick Follows, a senior research scientist in EAPS, to study the distribution of particular phytoplankton types, as well as to observe how phytoplankton help move different elements through the oceans. To study these cycles, Barton’s team plugged information about the traits of nearly 80 phytoplankton species, such as how fast they grow and what temperature they prefer to live in, into the computer model, which also simulates the physical circulation and currents of the ocean. After the computer progressed the virtual ocean forward for a decade, certain patterns began to appear, with more species appearing in the warm tropics and Gulf Stream regions than at colder, higher latitudes. Barton’s team then hypothesized why those patterns occur, taking into account the circulation of the ocean in different regions, as well as the fact that growth rates depend on changes in temperature, light and nutrient concentration. They conclude that the amount of species in a given location is based on how rapidly species are removed because of competition for limited resources, and the rate at which species are returned to that location by the ocean’s currents — a balance that is also affected by the nature of the environment. In the tropics, seasonal variations are weak, and different species can coexist for long periods. But there is less diversity at higher latitudes, where the changing seasons vary the amount of light and nutrients that phytoplankton can consume throughout the year. Here, a few highly specialized phytoplankton rapidly outcompete all others during the strong spring blooms, and this effect outweighs the rate at which the ocean’s currents can return species to these latitudes. Barton and his colleagues also explain that a relatively large variety of phytoplankton coexist in the Gulf Stream and similar currents that constantly move and mix different species from different regions. In this case, the variability of the environment doesn’t matter, because the intensity of the currents prevents more dominant species from outcompeting other species for food. Princeton ecologist Simon Levin called the research “highly original and exciting” for scaling microscopic details of the ocean to macroscopic patterns by combining fluid dynamics, ecology and evolutionary biology data into one model. He also thinks the research will be useful for planning future studies where phytoplankton are collected. Barton and his colleagues hope their interpretation will help inform future mapping surveys of the ocean by guiding oceanographers where to look for particular patterns in phytoplankton diversity. They need new field data to test and refine their hypotheses and are currently speaking to scientists at Woods Hole, MIT and the University of Hawaii about collecting data on upcoming long-distance scientific explorations in the Pacific Ocean. Barton’s next step is to evaluate the diversity patterns using a very high resolution version of the current computer model to examine how the ocean’s complex range of structures — small eddies, currents and fronts — provide small habitats that could enhance diversity. Future research should also examine how the processes of extinction and evolution help maintain the diversity patterns, he said.